Software to estimate the smectite content and number of consecutive illite layers in mixed-layer illite-smectite using illite crystallinity data. Illite crystallinity is an efficient low-grade metamorphic indicator, the value of which depends on several factors. 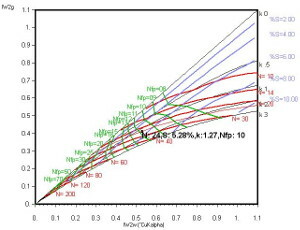 Program NEWMOD allows one to evaluate the dependence of IC for air-dried and ethylene-glycol treated samples on the mean thickness (number of layers) of illite crystallites (N), on swelling interlayer (smectite) content (%S) of illite, and with ordering parameters that describe layer stacking. Using these relationships, software “PATISSIER” allows the estimation in illite-smectite of N, %S, and the number of consecutive illite layers. The latter corresponds to the physical value hidden in IC that best describes metamorphic grade. Software “PATISSIER” can use old data sets to reinterpret many existing measurements using the IC method, the so-called Kübler index. See M. Jaboyedoff and P. Thélin (2002): PATISSIER: software to estimate the smectite content and number of consecutive illite layers in mixed-layer illite-smectite using illite crystallinity data. SCHWEIZ. MINERAL. PETROGR. MITT. 82. The name “Patissier” means pastrycook in French. Because clay minerals can be considered as milfoil… Thus when we discussed about this with BERNARD KÜBLER, the father of the illite crystallinity, he found that very funny, and thus we kept this name. Example files from: Illite Crystallinity values from: Kisch, H. J. and M. Frey (1987): Appendix: effect of sample preparation on the 10 Å peak of illite (illite ‘crystallinity’). In: Frey, M. (ed): Low temperature metamorphism, Blackie, Glasgow, 301-304.